Created using By using what I was taught while studying at Monash University, Algorithm and data structure. I had developed this application by using Unity 3D, by using C# programming language. This simple application is to demonstrate my implementation of Dijkstra’s Algorithm. I developed this application after I graduate from the University, to make sure that I still have the understanding of what was taught. Furthermore, the modules on the code allow me to reuse it in the future, for example, an RTS game or an MMORPG. Created using python3 with Tkinter, the application uses Yahoo weather API to retrieve weather information of the location that the user desired. This project was created as I had a raspberry pi lying around and my bedside clocked had recently been broken. 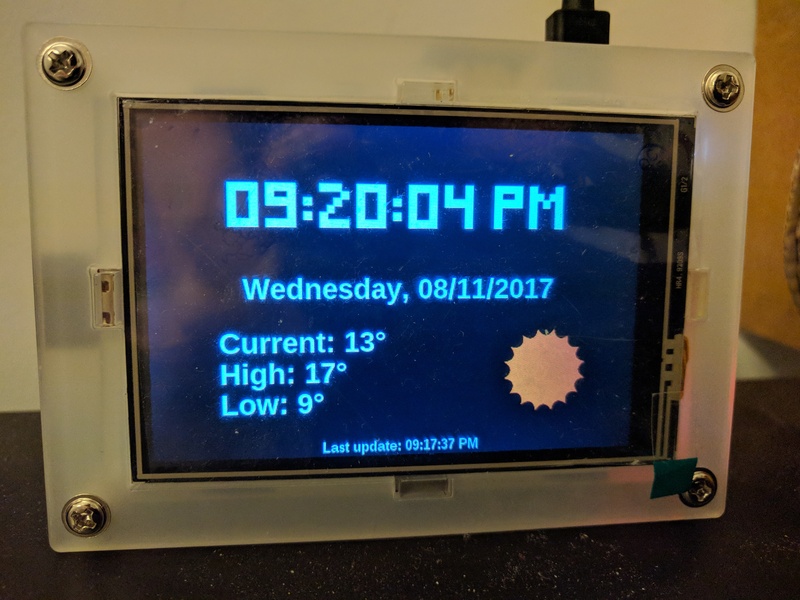 Therefore, I purchased a 3.5 inch LCD screen for the raspberry pi to use it a bedside clock. Due to the limitation of the screen, I could not add any more information, such as hourly weather forecast. A customized discord’s bot that was created for Pokemon Singapore. It is used to store and display Nintendo 3DS and/or Nintendo Switch friend’s code with the use of chat commands. It was written in python with discord.py as it’s discord API. SQLite was chosen as the database due to budget constraint. However, since the query is similar to MySQL, it could be easily modified and changed to MySQL when I have the necessary budget. A side project that I decided to take up during my free time and coded this in python. The core idea of this work was to allow me to set up a backend where games could connect to the database via web services. Thus, I decided to use my free time to study up on the different type of web services and study about RESTful API. Which led me to create a centralized Amiibo database for its NFC information as a mini project instead of a game, which also allows me to portray my first idea. During my semester at Monash University, I was tasked to design an application that uses leap motion and virtual reality to teach the concepts of programming. The topic that I chose was inheritance. This application created using unity was to teach inheritance concept uses in programming and games. The idea behind was that how clones objects in gaming inherited from an object, that allow easy manipulation of data. The team in Packt Publisher had recently invited me to be a part of the team as a tech reviewer for this book. I was tasked to provide any feedback or edit any codes that are written in this book to improve the quality of the book and readability for the readers. It was a great experience for me to work with them and this book had an excellent introduction to building up an FPS game by using Unity 3D. This is my very first 3D model that i did with Autodesk Maya. Currently i am studying foundation of 3D and i hope that with practice i could improve my 3D skills. I am trying to understand the concept of first-person shooter(FPS) by creating a concept similar to elder scrolls where is based on first-person view role-playing game style. I also tried to make a simple pathway system and AI system where monster attack if the player is within a certain range. It also shows a simple environment interaction and item pickup.